Is Kayaking Good for Kids? Planning a family holiday in Jervis Bay? Welcome! This is undisputably one of Australia’s top destinations for families with children. There are countless family-friendly activities to keep you busy from morning ‘til night. For those who enjoy nature and a touch of adventure, a kayak tour might be a perfect addition to the itinerary. Kayaking in Jervis Bay is one of the finest ways to enjoy the beautiful, serene waters of the bay and explore the area, while also having a fantastic time. Best of all, kayaking is a great activity to do with your children. Kayaking is excellent for family holidays. Read on to learn more. 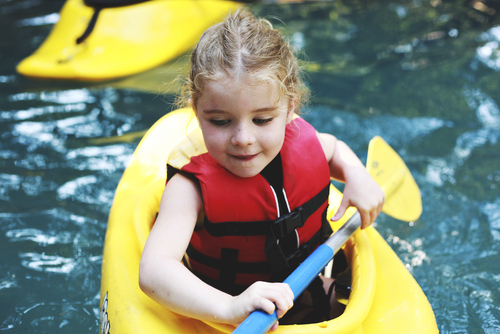 Kayaking is a fairly low-key activity, which makes it perfect for both children and adults. It doesn’t require a lot of strength to successfully paddle a kayak, so older children will be happy to put in the “muscle” and help to manoeuvre the kayak through the water. Younger children can sit close to adults and assist a parent with paddling or simply sit and enjoy the ride. The gentle waters of the bay, calm and shallow close to the shoreline, also make this a perfect spot for a pleasant kayaking journey. The region provides wonderful views and frequent wildlife sightings, which are heaps of fun for kids. Your whole family will love the beauty and splendour in this safe, relaxing area. Our Jervis Bay Kayak Hire is known for excellence and quality. For each and every client, our main focus is your safety. When kayaking with kids, this is an extra special priority. All guests will be provided life jackets, whether you’re hiring a kayak or SUP paddle or joining us for a guided tour. Before departure, we’ll help to ensure your children are outfitted properly and securely with a well-fitting life vest. Please note, while children and adults of all experience levels are welcome to kayak with us, we do require that participants are able to swim confidently. This may prohibit younger children who lack the swimming experience from joining in a kayak excursion. If you have any questions, please don’t hesitate to get in touch with our team. To ensure your kayaking experience with your children is a happy and memorable one, we have several tips and suggestions. In most situations, a double kayak is advisable. In this vessel, you can place your child in the forward position, allowing you to keep an eye on him or her. If you are hiring a kayak on your own (without a guided tour), plan your journey’s path ahead of time. It is a good idea to stick close to the shoreline, both for safety’s sake and to help you and your children get a feel for the kayaking experience, while still keeping close to land should you need to come ashore. If you’re travelling with smaller children who are not paddling, they should be placed closed to adults and within arms’ reach. We hope you will plan to join us soon in Jervis Bay for a guided kayak tour with one of our expert guides, or to hire vessels for your own afternoon of family adventure. We’re located right in Huskisson and convenient to all major attractions and accommodation in the Jervis Bay area.